Yeah, we called that conveyor belt the "chain." There was one that took the patties through the open flame and another one next to it that toasted the buns. The meat chain was removed every night and placed in a container of lye. There were two meat chains - one used to cook the patties and the other one soaking in the lye. One of the worst jobs was cleaning the chain. After it had soaked for 24 hours, it still had to be scrubbed with a steel wool pad. After it had been cleaned, it was exchanged with the one that had been used that day. This was a daily operation as was filtering the shortening in the 3-vat fryalator. 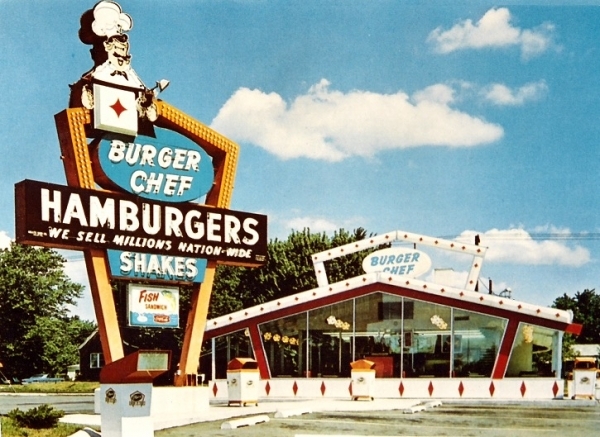 When I left home and started college (1965), there was a Burger Chef one block from my apartment. In the back of the restaurant was a training center. I ate there maybe 4-5 times a week. Of course, hamburgers were still 15 cents, cheeseburgers 20 cents. The patties rode a conveyor belt into a flame broiler that hit them from both sides at once. When they came out the other side, they were done perfectly. The double cheeseburgers were my favorite. Later, they added a works bar where you could apply your own condiments. Great place! Still miss it. I grew up on Long Island, and don't recall ever encountering a Burger Chef restaurant. First I heard of the company ,actually, was on recent episodes of Mad emn. My favorite burger place was called Burger 'n' Shake. We indeed made a decent flame-broiled burger and the best French-fries in town because they were made from scratch! As a child whenever you had a birthday you could pick where you went for a dinner out with the family. I always picked Burger Chef. I loved their Burgers. I used to work for this outfit from 1968 to 1970. Started at $1.00 an hour and moved all the way up to $1.50 and hour as the night manager! Ha!